Marc performs in London, across the UK and internationally as a solo recitalist and concerto soloist. After experimenting persistently with a toy xylophone, Marc received his first piano lessons at the age of five from Angela Ross. He studied at the Royal College of Music under Gordon Fergus-Thompson, graduating in 2007. After graduation, he continued his studies with Gordon privately for three further years. 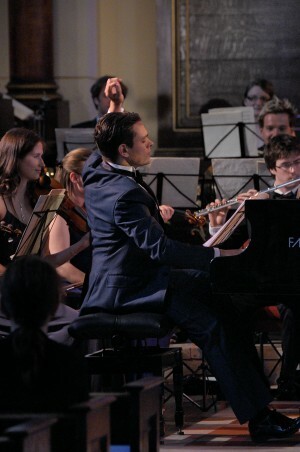 He has performed in masterclasses with Nelly Akopian-Tamarina, Andrew Ball, Nigel Clayton, Alexis Ffrench, William Fong, Ronan O’Hora, Vanessa Latarche, Martin Roscoe and Yonty Solomon. As a solo recitalist, Marc has performed across the United Kingdom and Channel Islands, at several of London’s leading performance venues and in Italy, Austria and Greece. His repertoire ranges from Alberti to Zimmerman; including many principal piano compositions of J S Bach, Haydn, Mozart, Beethoven, Schubert, Chopin, Schumann, Brahms, Liszt, Debussy, Ravel and Rachmaninoff, highlights from numerous other composers and contemporary works. Marc performs frequently as a concerto soloist. He has given numerous performances of Mozart Piano Concertos nos. 21 and 23, Grieg Piano Concerto, Tchaikovsky Piano Concerto no. 1, Rachmaninoff Piano Concerto no. 2, Shostakovich Piano Concerto no. 2 and Gershwin’s Rhapsody in Blue. He has performed twice as a concerto soloist at London’s Cadogan Hall (with both Tchaik 1 and Rach 2); at local venues across the UK; frequently at St George’s Hanover Square, St Paul’s Covent Garden and the Royal Pump Room in Bath and on tour in Austria with Kammerphilharmonie Graz. Among others, Marc has collaborated with conductors Toby Purser, Andrew Gourlay, Andrew Griffiths, Achim Holub and Edward Farmer. To watch Marc in performance, please visit his YouTube channel or click on the clip below.